T-Mobile’s quest to Nexus-ify their Android lineup continues today with the opportunity to purchase the Nexus 7 through Google’s Play Store with a T-Mobile SIM. Available for $299, the Nexus 7 with T-Mobile SIM and HSPA+ 21Mbps connectivity is available with 32GB of internal storage. Devices are expected to be delivered within 3-5 business days, which will make you the envy of all your Nexus 4 friends still trying desperately to get their hands on one. 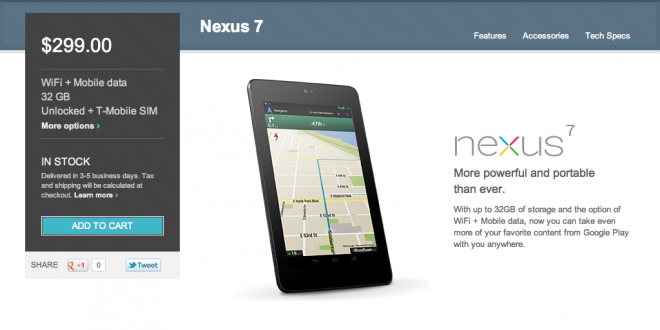 Starting today, 1/16, the Nexus 7 will be available with T-Mobile’s 4G service at Google Play. To purchase the device with a T-Mobile SIM card, visit Google’s Play Store. As for the Nexus 4, T-Mobile has confirmed the Nexus 4 will be available in all T-Mobile retail stores nationwide in the coming weeks. The sought-after device is also expected to be back in stock online through T-Mobile.com beginning on January 23rd. Nothing on Nexus 4 yet? At least T-Mobile has now given us a definite date for availability online (January 23rd). That’s more than can be said for the Google Play store! The AT&T version of this tablet was blocked by T-Mobile if trying to use a Monthly 4G SIM. Think it’s the same story with this one? I wonder if Google/LG is just sending all the Nexus 4’s to just the T-Mobile stores, and leaving their storefront bare? I wonder who gets that extra revene generated by T-Mobile’s markup? T-Mobile? LG? Google? All Three? From my understanding of the Nexus 4 pricing, the T-Mobile price isn’t considered a markup. Rather, the PlayStore pricing is subsidized by Google, so it’s actually a markdown. So I would imagine that close to a standard revenue split happens with the devices that are purchased from T-Mobile, while Google pays LG a subsidy for every phone sold through the PlayStore. I could be wrong on this, but this follows what I’ve been hearing about the pricing of the Nexus 4. I’m getting tired of all the stupid and ignorant comments that presume the Nexus 4 is somehow a profitable device for T-Mobile to sell unlike any other. Profitability is probably no different than its current high-end line up. Are people really that stupid to think the play store / google are minting duckets by selling this phone? I blame pundits like David for writing that illinformed opinion piece on why it was shameful for T-Mobile to markup the price of the nexus 4 due to greed. Talk about simpleminded knee jerk reaction. Ask the right questions and understand the nexus program before going off on a rant David. @5a0a62bb2ba689e4a6bdc246013c243b:disqus Dude, relax I was just making a dig at the abhorant lack of Nexus 4 anywhere INCLUDING T-Mobile. I know how the program works and I know they sell at cost or a loss, as they make their money in ad revenue/content. What matters is that they get these bad boys in the hands of people as opposed to blaming each other as to why there is a shortage in the first place. If I remember correctly, David either updated that orginal piece or wrote a new one about how he was misinformed. He was basing his piece on the pricing during the time of lauch, where there was VERY LITTLE info based on his own contacts and sleuthing. Besides, it’s not like it’s an invalid complaint. At the end of the day, T-Mobiles pricing is still WELL above what you can supposedly buy it for at Goolgle’s storefront. Anybody that did some shopping around or research would know that. I gather you have all the right answers to everyone’s burning questions, so where’s your piece explaining all this then instead of having a simple minded knee jerk reaction to someone elses “simple minded, knee jerk reaction”? I think that originally, Google’s plan was to sell unaltered android devices supplied by LG. Going by the cost figures for iphone which was under $200, both LG and google may have made profits of $50-$100 each per device on Google play. However, suddenly the cell operators all wanted a piece of the action. And that made everyone scramble to meet the increased demand from all sides. The cell operators cannot sell the nexus 4 for the same price as google play, given that they were selling similar phones for higher prices. It is possible that a future nexus will have slightly scaled down h/w in the play store to justify the lower prices. I would not transfer SIMs; it is technically possible but US operators don’t like that concept much. I once used a SIM designated for a prepaid phone on a nicer smart phone and they simply deleted my account, made the SIM inactive and no one in customer service had any record of what happened ! Ok…so with my SIM in it, can I make voice calls or is it still missing a dialer? If the plan has minutes, you can use google voice to make calls and receive them- but they will use your minutes. To save on minutes (or in pure data plan), use groove IP or something similar (VOIP). Even skype ( it costs extra though) will do. Will you be able to use the Nexus 7 as a hotspot on T-mobiles network? I have that functionality with my original Galaxy Tab but won’t upgrade if I can’t tether wirelessly. How come T-Mobile stores now have the Nexus 4 but not Google Play Store? Don’t waste your time on the next 4, I’m on my sec replacement phone! The the interior build of this device is horrible! Don’t get me wrong the exterior looks nice! Problem: the phone rattles, makes weird noises coming from the back of phone, overheats, and lastly but most important, there is this weird alien Luke sound that comes out of the earpiece where u hear ur phone calls. The phone could be not in use and you can still hear these static sounds! :((( both phones did it! I picked my Nexus 4 up from the T-mobile store on Tuesday. I would check and call your stores. Most stores are only getting 5-6 per store. Nexus 4 in many stores now CLEARWATER FL Countryside mall T-Mobile has several.